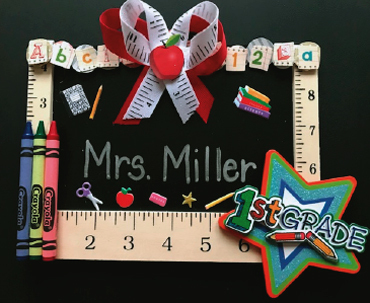 These very special artworks are just some of the works that can be special gifts for the holidays for a favorite teacher, friend in a particular profession, nurse, doctor, dentist, or that very special princess of your family. 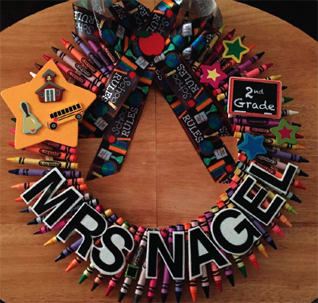 The special wreaths are just about all sold out but are great ideas for upcoming holidays in 2018 and definitely a wonderful end-of-the-schoolyear gift for a teacher. Before they are totally sold out, place your order now for the upcoming year! 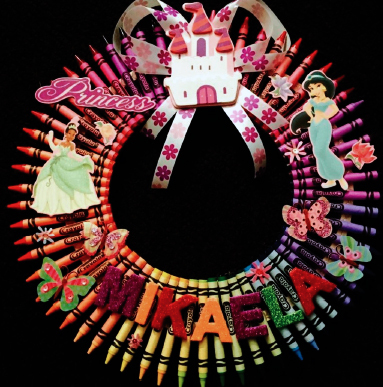 Cost for the Personalized Wreaths: $59.95. For the artworks at the top of this page, the customer can request any name to be on the slate. Ah! Another unique holiday gift for a child’s teacher or an employer’s administrative assistant. 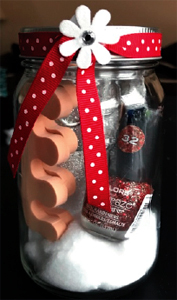 Then, there is the decorative jar with items like manicurist items or other requested items that match the desired goodies for that special loved one and/or friend. Cost for the smaller artworks: $19.95. Since every order is custom-made, to allow time for designing and shipping.